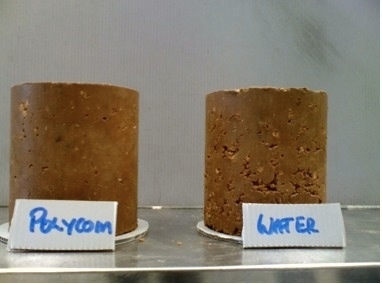 PolyCom Stabilising Aid is now ten years old and from the initial works in 2003 has rapidly risen to be the most widely used ‘polymer’ stabiliser in the world today. Proudly Australian designed and manufactured and with distribution and support networks in Australia, Africa, South America and Asia it has earn’t it’s reputation through consistent, economic, quality results in most soil and gravel types. PolyCom has a negligible carbon footprint and is competently installed using a grader crew or rotivator which enhances it’s reputation for versatility and ease of use particularly in the area of ‘Subgrade Stabilisation’. The mechanical compactive effort applied on site is the make or break of the job regardless of the material type or stabilisation product selected. Long term stability of any constructed area is a direct reflection of this mechanical effort being competently applied to the work area. A failure to achieve adequate full depth compaction can result in unnecessary early maintenance or structural repairs. PolyCom, when installed during your normal moistening of the construction area facilitates higher and more consistent densities throughout the layer being worked. This higher density and polymer bonding means a stronger mechanical interlock, which is inherent but not always fully utilised in most material. Couple this with the products hydrophobic effect, introduced flexibility and overall material strength increases and you have a simple, economic and sustainable solution to Subgrade Stabilisation.